President’s Day gives us an opportunity to reflect on the leadership of our great country and appreciate how far we’ve come. But what about the support that the presidents received while they were in the White House? We’re talking about their pets here. We all know that pets are truly the backbone to all great things. It’s only fair that we give them credit where credit is due. In honor of President’s Day, we've compiled a list of Embraced pets with presidential names. The Embraced pets named Hoover are both Labrador Retrievers. Embrace covered a total of 605 claims for pets named Lincoln in 2017 and paid a total of $99,984.78. Great Danes contributed 133 of these claims, totaling $40,145.16. Only one pet named Roosevelt had a claim in 2017, a Petit Basset Griffon Vendéen who lives in – you guessed it – Washington DC. Embrace covers three pets named Biden. One is a Domestic Shorthair cat with a pet-sibling named Obama. There were 113 claims covered for pets named McKinley in 2017 for a total of $64,351.52. For more presidential pet points, visit https://www.embracepetinsurance.com/waterbowl/article/presidential-pets. Embrace Pet Insurance is an Ohio-based pet health insurance provider, offering comprehensive, personalized insurance products for dogs and cats across the United States. 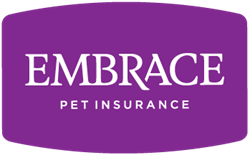 Embrace is consistently ranked as one of the highest-rated U.S. pet insurance companies, and is a proud member of the North American Pet Health Insurance Association. Embrace is the only company to offer a diminishing deductible feature, the Healthy Pet Deductible, and continues to innovate and improve the pet insurance experience for pet parents across the country. For more information about Embrace Pet Insurance, visit http://www.embracepetinsurance.com or call (800) 511-9172.